First touch in soccer is crucial and more and more important as players get older and need time on the soccer ball. Good first touch soccer skills will allow players more time on the soccer ball to make creative decisions on the field. This soccer drill is very simple to use, and can be done as part of the warm up routine, or as a first touch training drill during practice. Players will benefit from this soccer drill by developing the habit of playing simple soccer where passing is nice and firm with players staying on their toes throughout the exercise. Players will develop first touch on the soccer ball, to be more skilled with the ball both offensively and defensively. This drill will teach players to control the ball with the first touch, moving into space, and following with a second touch pass that will have to go through the passing cone channel. Split the players into groups of 2, with one soccer ball per group. Set up 4 cones 5 – 10 m/yd away from each other to create square grid for this drill. Players will take position on the outside of each end of the square. Player with the soccer ball, red player, will start with a one touch pass through the center of the cones to his/her teammate on the opposite side of the gird. This pass should be made using the correct passing technique (eyes on the soccer ball, toes up, ankle locked, firm contact on the ball). Player receiving the soccer ball will use the first touch to control the soccer ball to the left or right side, making sure that the first touch control gets the soccer ball into space outside of the cones. 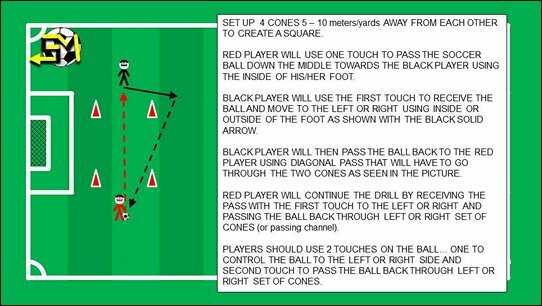 Player will follow up with a second touch pass diagonally through the cones and towards the red player. Red player will keep the flow going by repeating what the other player did… control with first touch to one side (left or right) and pass the ball back diagonally through the cones to teammate on the opposite side. When performed correctly, this drill should be smooth with players using the first touch for control, and second touch to pass the ball back and forth. Make sure the players are using correct technique in practice with every soccer drill. If the technique is wrong, stop the drill, correct it and instruct players to slow down and do it right. Players should be putting in 100% effort game like effort. Make this drill more competitive by having players count every pass not made through the passing cone channel, knocking over a cone, or more than 2 touches on the ball to pass it back. Modify this drill by allowing passes to be in the air with the same goal… control the air pass to one side and pass the ball back in the air through the passing channels. If it proves to be difficult for players to do 2 touches with the passes, allow more touches on the ball, depending on the skill and age of the players. Players need to be encouraged to control the ball using both, the inside and outside of the foot, when moving to either side. ALWAYS PRACTICE WITH BOTH FEET, LEFT AND RIGHT. Players that can play with both feet have an advantage on the soccer field, both defensively and offensively. Get creative and make up your own rules. Have fun and keep playing / coaching soccer.